On 14th April 2015, our intrepid team boarded flights to begin their journey to the High Atlas Mountains of Morocco. 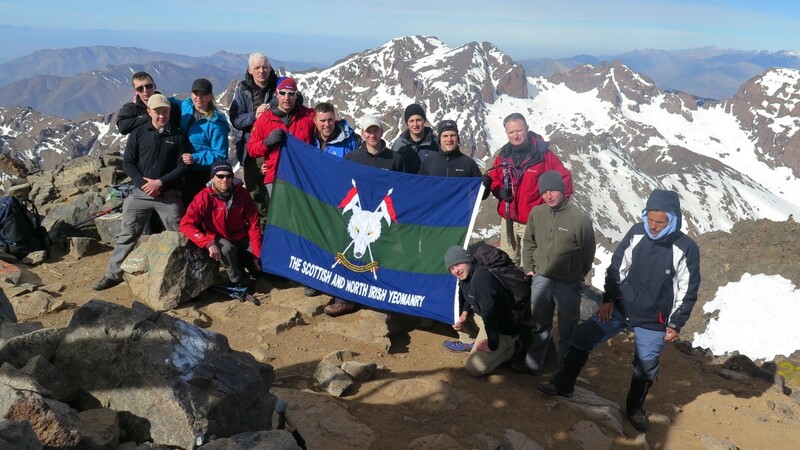 The aim of the expedition was to complete a demanding six day trekking expedition culminating in the summit of Jebel Toubkal , the highest mountain in North Africa, whilst increasing cohesion between our geographically disparate Squadrons. The team totalled 14; ten members of The Scottish and North Irish Yeomanry and four members of our paired Regiment from the Regular Army; The Royal Scots Dragoon Guards. Arriving that evening, it was a quick haggle for a knuckle-whitening taxi ride through the streets of Marrakech, where the Highway Code is less a code and more a collection of optimistic suggestions, to our Hostel in the Medina. Although wearied by the day’s travels, there was just time to take in the sights and sounds of the Jemaa el-Fna (central square) before bed. We rose in the morning to the first of many cups of mint tea before being whisked to the small village of Imi Ourhiad in the steppes of the High Atlas Mountains where we met our guides for the trip; two members of the native Berber population named Hassan and Ibrahim. With the mules loaded with water, kit and equipment; we stepped off East, bound for another small village named Tidli where we would spend the night in a basic hut or ‘gite’. Along the way we passed through a number of Berber hamlets, wishing hearty bonjours to the local children as they turned out to try their luck for sweets and pens. Lunchtime was as much an equally fantastic feast for the eyes as the stomach; mint tea followed by an impressive presentation of curried beans, fresh fruit and vegetables on the banks of the Assif n’ Imenane. The entire group enjoyed trying a new cuisine that contrasted heavily from their usual ones! After a brief chance to soak up our beautiful surroundings we continued on, arriving at our accommodation in time to watch the sun drift behind the valley walls and marvel at the beautiful pair of red socks it had given to Private Dalgoutte. The breakfast each morning was a mountaineer’s culinary fusion; the familiar elements of breads and spreads paired with the more adventurous yellow teas and fig jams, the perfect start for another day of trekking. We hiked up to the village of Oukaimeden, stopping briefly to barter with the locals for snacks and for Corporal Molloy to push his baggage allowance to the limit with geodes and fossils. The chance to interact with individuals from such a different background was an enlightening experience, particularly for those who had never ventured beyond English-speaking countries. We then descended through the Tizi nou Addi pass to Tacheddirt, where we were entertained by our guides and muleteers performing a selection of their traditional singing and dancing, eventually regretting the decision to get the expedition leader involved as he upstaged everyone with his rad shape-cutting. Not to be outdone by their hosts’ performance, the expeditionary team returned with an angelic delivery of Wonderwall. The next three days continued according to our acclimatisation plan; climbing high in the day and sleeping low during the night, gradually ascending to higher points with each day to get our bodies used to having to work harder in thinner air. We were certainly working harder by day six, strapping on crampons to give some traction in the last of the winter snow as we slogged up the steep incline of the Azib Tamasoult, which we elected to climb as the crow flies for the additional challenge. 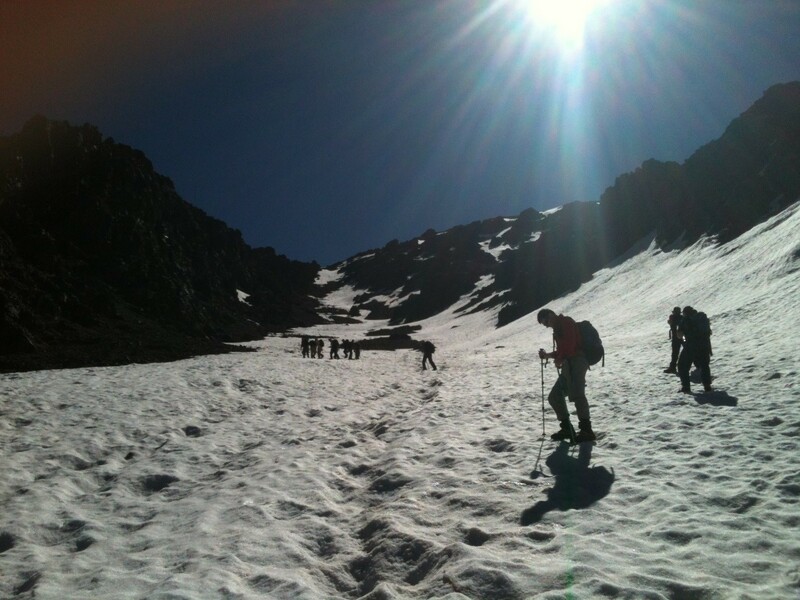 On the final day of our expedition, we set out at 5am for the summit of Jebel Toubkal. Our acclimatisation had prepared us well, and the hard work of the previous day made the final ascent much easier. We arrived at the peak to be greeted by stunning Southern views of the Sahara desert. 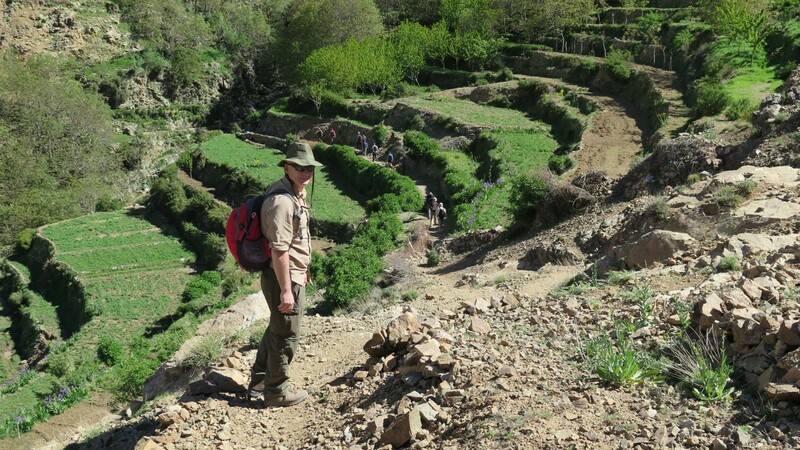 After much hand-shaking and selfie-taking we began our descent by the Northern face back to the valley floor and then on to Imlil where we said an emotional farewell to our Berber companions and returned to Marrakech. We were all extremely grateful to the Ulysses Trust for their generous support, without which we could not have enjoyed this opportunity to find challenge and build character with such a magnificent selection of new and different experiences. The victorious team on the top of Jebel Toubkal (4,167m).